Awnings may be the answer to your exterior decoration needs and indoor temperature control whether you are a homeowner or a business-owner in Sunset District, Richmond District and Mission District or other areas of San Francisco. Awnings are usually made of canvas or other fabric stretched over a light frame and attached to the exterior wall of a home, business or other structure. Metal awnings, removable awnings, retractable awnings, canopies, sun sails and freestanding awnings are also available. Most awnings are installed over windows or doors to block unwanted direct sun, or over exterior patios or porches to make the areas more comfortable during warm days. Businesses may also use awnings as decorative features that display the business name or logo. Regardless of your needs, you will be able to find an awning that makes your home or business more attractive, functional and comfortable. Read on for more information about the options you have in choosing and buying new awnings in San Francisco. Depending on the needs of the homeowner or business-owner, awnings may be retractable or permanent. Permanently fixed awnings are usually those used for decorative purposes, as they offer little versatility. Retractable awnings are popular in the Tenderloin, the Excelsior District, and Bernal Heights, Inner Sunset, the Castro, Cow Hollow, Japantown, Koreatown, Telegraph Hill and Treasure Island, and beyond for their ease of use and flexibility. Retractable awnings give you control over how much sun reaches your building or outdoor area. These awnings open easily using mechanical or manual cranks to block hot sun or light sprinkles and rain. 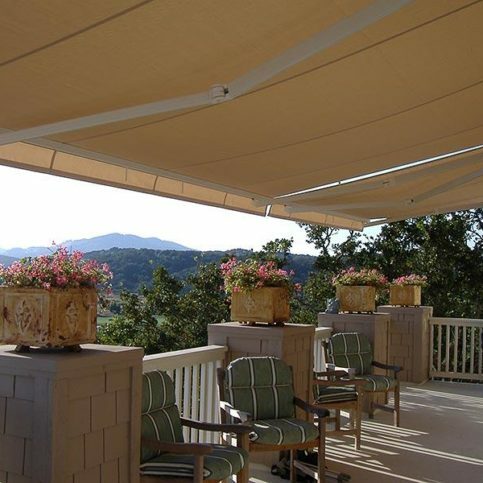 Restaurants in San Francisco and the Bay Area may install awnings to provide comfortable outdoor dining areas for customers; while homeowners can install them on the exterior of their home to lower cooling costs and protect furnishings from fading, or they can install them outdoors to make their deck, patio and poolside area more comfortable. Manual retractable awnings require the user to physically open and close the awning shade. These are often the most affordable awnings in San Francisco, as they are simpler in design and construction than electric models. They also may be easier to adapt to most outdoor areas. Manual awnings usually require the installation of permanent support arms that stabilize the unit, and may allow use in windier conditions. Motorized retractable awnings open and close via automatic, or electrical, means. These are often more expensive and require a solid surface for mounting, as they do not have any vertical supports. Instead, motorized awnings use retractable lateral arms for stability. This makes them very small and unobtrusive when not extended. Most motorized retractable awnings open and close using a switch, button or remote control. Automatic awnings are also popular in Pacific Heights, North Beach, Excelsior District and the Sunset District and other parts of San Francisco. These include retractable awnings that have sensors to monitor for rain, wind and sun. When conditions are right for extension or retraction, these awnings open or close without human interaction. Some awnings come with additional accessories, including valances for decorative purposes, screening to keep out insects, and lighting for entertaining outdoors in the evening. Why Trust Diamond Certified Awning Companies Rated Highest in Quality? A: I like both, but I have a cat, so I’m probably more of a cat person. Q: If you were doing karaoke, what song would you sing? A: “Rolling in the Deep” by Adele. Q: What insect best characterizes you? A: The bee—they’re hard workers and they function well as a team. Q: What do you like to do on a rainy day? A: Have a cup of tea and play the piano. A: Lotus Cuisine of India in San Rafael. Awning associations like those below may be able to provide more information about awnings, awning installers, and choosing the best awning for your home or business. Knowing what you want in your new awnings before you start looking can help you make better decisions when vising San Francisco awning stores. You’re more likely to be happy with your new awnings if you have an idea of the type of new awnings you want, your budget, and other details about your sunshade purchase before you look at your awning options in stores in Nob Hill, North Beach, the Sunset District, SOMA and the Bayview District or near you. Ask yourself the following questions to start. Write down your answers and keep a file of samples and examples that you want to further explore. Do I want a Diamond Certified awning company that is rated best in quality and backed by the Diamond Certified Performance Guarantee? Where do I need new awnings—my home or business? Are there any requirements I have for this project or for my new window awnings (such as the color, style, size or accessories)? Do I want fixed awnings or retractable awnings on my home or business? What is my budget for my new awnings? Do I need my new awnings installed, or am I comfortable installing my new awnings myself? What characteristics am I looking for in my awning store or awning installer? Once you have a good idea of the types of awnings that will best suit your project and the services you will need to complete your awning installation project, and when you have interviewed representatives from a few San Francisco awning companies in person, it’s time to make appointments to visit with awning companies in person. This will give you a good chance to see the awnings available to you and to discuss your project with the San Francisco awning company. How much time will it take from start to finish to get my new awnings? Will I need to special order the window awnings I want, or are they available to take home right away? Will you or someone else need to install the awnings I am interested in, or is this a job I can do myself? How would I handle future service issues? Are you responsible for warranty work if there’s ever a problem with my new awnings? What can I do to ease the purchase and installation of my awnings? It’s best to choose a Diamond Certified awning company because all certified companies have passed an in-depth ratings process that most other companies can’t pass. If you want quality from the new awnings you buy in San Francisco and the rest of the Bay Area, you can have confidence choosing a Diamond Certified company. If you can’t find a Diamond Certified awning contractor in Sunset District, Richmond District and Mission District or within reach, you’ll have to do some research on your own. If you do, it’s wise to call some references provided by the awning companies you’ve contacted. Keep in mind, though, that references given to you by awning stores in San Francisco and beyond are not equal in value to the large random sample of customers surveyed during the Diamond Certified ratings process. That’s because references given to customers from companies are cherry-picked to include only satisfied clients instead of random names selected from all their customers. If you do call references on your own, specifically ask for a list of the awning company’s 10 most recent customers. This will help avoid them giving you the names of only customers they know were satisfied. Were you satisfied with the new awnings you purchased from and/or had installed by _(awning company name)_ and the service you received from the company? Was the staff at the awning store able to suggest the best type of home awnings for your needs? What was the type and scope of job they did for you (home awnings, business awnings, window awnings, retractable awning installation, new home canopies, sunshade awnings, permanent window awnings, metal window awnings, motorized awning repair, etc.)? Did the awning store have the awnings you wanted in stock, or did you have to special order them? If so, did they arrive in the time-frame promised? Did the contractor keep you up-to-date on the status of the awnings you’d ordered or were having installed? If you hired the San Francisco awning contractors to install your new awnings, did they complete the work on time and as promised? Were there unexpected costs associated with your new awnings or awning installation? If so, what were they for and were they avoidable? If you live in a rural or smaller area such as Chinatown, the Presidio, Twin Peaks, Western Addition and Barbary Coast did the awning delivery company or awning installer charge extra to travel to your home? Was this awning company responsive to your needs and mindful of your budget? What was the best part about working with this awning company / buying new awnings from this San Francisco awning store? Was there anything that concerned you or that went wrong? If you need new awnings on your home or business in the future, would you use this awning company again? Would you recommend these awnings and this awning store to friends or family? Review your interview notes and consider the following questions before making your final decision on an awning store or awning contractor in San Francisco. Is one of the awning contractors or awning stores in San Francisco able to meet your needs in terms of awning type, awning design, installation and budget for new awnings? 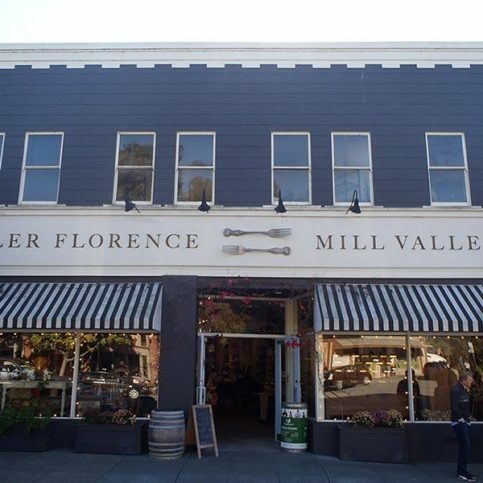 Are the San Francisco awning stores knowledgeable about the best type of awning for your home or business? Can they explain why they’ve recommended certain brands or types of awnings for your home or business (i.e. retractable awnings, automatic awnings, fixed awnings, waterproof awnings, etc.)? Is the awning company sensitive to your budget? 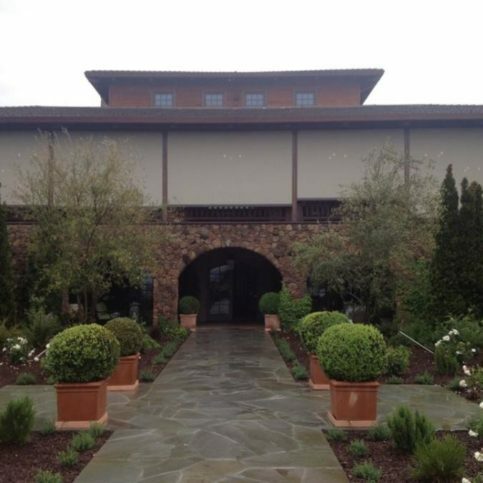 Can they recommend various solutions and awnings to meet your resources? Are the awnings from awning stores in the Tenderloin, the Excelsior District, and Bernal Heights covered by written manufacturer warranties to protect your investment? If you’re having your new awnings professionally installed, do the awning installers offer written warranties or guarantees on their workmanship? You’ll be much more likely to be happy with your new awnings if you take the time to do a little research before purchasing the new awnings or having them installed. Start by learning some basic information about awnings. Read about the difference between fixed awnings (permanent awnings), retractable awnings, manual awnings and motorized awnings. Research the different awning materials available. Learn about the ways awnings can be installed and think about which will be a better fit for your space. Once you have a good idea of what you’re looking for, you’ll be better equipped to talk with the staff at San Francisco awning stores, including those in Pacific Heights, North Beach, Excelsior District and the Sunset District, Duboce Triangle, Glen Park, Fort Mason, the Haight, Fisherman’s Wharf and Noe Valley and other areas. Knowing what you need before you start to look will also give you better boundaries so that you don’t end up paying for more than you need or want. You will also have an idea of whether you can install the new awnings yourself, or if you need San Francisco awning installers to do the job for you. Most single awning units, including retractable awnings and motorized awnings, are fairly simple to install yourself. They often come with all of the materials needed for installation and detailed instructions. Some awning companies provide customer support over the phone or online for DIY awning installation. If you are having many window awnings installed on your home or business, are having awnings installed on hard-to-reach areas, or aren’t very handy with do-it-yourself projects, you may want to ask the San Francisco awning stores if they provide installation services or can recommend qualified awning installers to do the job for you. As with any contractor you hire, you’ll want to be sure these installers are licensed, insured and come with good references who can vouch for their past work and customer service. Once you’ve found the San Francisco awning company you want to hire, move forward by ordering the awnings you need or purchasing them at the awning store. Some companies may ask you to sign an estimate and contract, others will only require you to come in and buy the awnings you want off of the rack. As with any other legal document, you’ll want to be sure both you and your awning company sign the contract. Contracts are binding, so be sure you completely understand the terms and agree to all items stated in the contract. Never sign a blank or incomplete estimate or contract. Chances are good that your awning installation will be simple and straightforward. If you are installing your new awning, you probably have little preparation work to do, other than in the immediate area where your new awning will go. If you are having San Francisco awning installers provide installation, however, there are a few things you can do to save time and money. Keep children, pets and others away from the installation area. For everyone’s safety, keep pets and all people not directly involved with the work away from the site of the new awning installation. Move any unneeded items away from the work space. Whether you are installing the awnings or having professionals do it, you’ll want to clear the space where the awning is going up. Take away window boxes, potted plants, decorations, and other movable objects to prevent accidents or injuries. Provide awning storage space if needed. For large jobs, the awning companies may need you to store the awnings or installation materials for a few days before or during the work. Ask the awning company if you’ll need to make space for materials and, if so, how much room and for how long. Make room for work trucks. Awning installation work, especially on large homes or commercial buildings in Nob Hill, North Beach, the Sunset District, SOMA and the Bayview District or other areas, may require the awning company to drive large work trucks or park large vehicles on site. These vehicles may require larger parking spaces or more clearance than passenger vehicles. Talk with your San Francisco awning service and ask them if you’ll need to make room for their awning installation vehicles. In extreme cases, such as very tall buildings that require scaffolding or bucket trucks, the awning installers may want to walk through the work site with you to identify any clearance issues. Finding and buying the best awnings for your home or business will be easier when you follow the advice above. Surprisingly, it can be an even smoother process when you take a few simple steps to be a good customer when buying new awnings in San Francisco, including those from awning stores in Bernal Heights, Bayview, Richmond District and Nob Hill and beyond. Let the San Francisco awning company know what you want from your new retractable awning or fixed awning, the long-term results you’re expecting and specific ways they can satisfy your expectations during the buying and installation process. Remember, a friendly smile goes a long way in avoiding and repairing strained working relationships. Before you buy new window awnings in San Francisco, restate your expectations and goals, and reiterate to the awning company representative your understanding of the agreement. Most problems with local retractable awning companies occur because of a breakdown in communication. By being clear about your expectations and theirs, you can avoid most conflicts. Ask your awning store if you should call to check on the progress or if they will call you with updates if you have to special-order your new awnings. Be sure your service representative has a phone number where they can reach you while you are waiting for your new retractable awnings to arrive. If you are hiring an awning contractor in San Francisco to install your new awnings, be sure to return calls promptly to keep the window awning installation on schedule. Pay for your new awnings promptly. Why would you want to be a good customer? Awning companies in San Francisco appreciate customers who are honest, fair, communicative and easy to work with. Your good customer behavior sets the tone from your end and creates an environment conducive to a good relationship. Your new awning purchasing process and installation may in fact go smoother and any problems may be more easily resolved. Check over your awnings and all included materials upon delivery. Ensure that the item is new, undamaged, and exactly what is listed on your invoice. If you’ve had your new awnings installed, also verify that all work has been done to your satisfaction and is done the way the contractor promised. The name, physical address and state license number (if installation work was performed) of the San Francisco awning store or awning installation company. A complete list of awnings purchased, including brand, size, color, material and model number. An itemized list of all installation materials purchased. The total cost for awning installation services, including an itemized amount due for labor. A written explanation of any warranties or guarantees provided by the product manufacturers, awning store and awning installation contractors. Confirm any warranties offered by the awning manufacturers or awning stores in San Francisco, including those in the larger cities of Sunset District, Richmond District and Mission District or your area. The awning store’s physical address. What the warranty covers. This should include whether the awning company or awning seller will replace or repair faulty products. Any exclusions must be explicitly stated. Your responsibility in the case of a problem with your new awnings and what you need to do in order to redeem the warranty. If the awning warranties are transferable if you sell your home or the building on which the new awnings were installed. 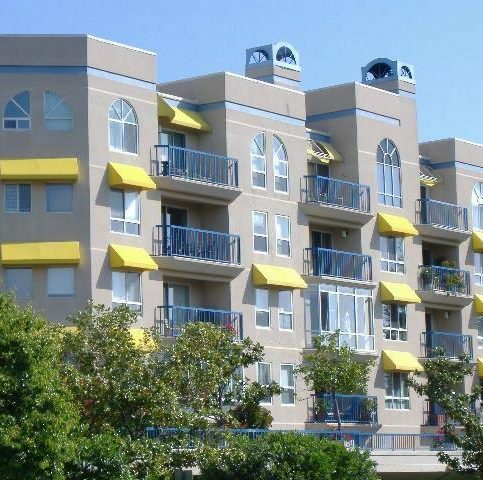 A huge variety of awnings and awning services are available in San Francisco, including the Tenderloin, the Excelsior District, and Bernal Heights and other areas. Some are more popular than others, however. A list of those popular awnings and awning services is listed below for your convenience. Talk with the awning companies near you to find out exactly what types of awnings are available to you. These awnings are retractable, meaning they roll or fold up manually or automatically. Retractable awnings are popular on porches, patios, restaurants, windows and other areas where the awning is only needed to block out direct sun during part of the day. When the area is shaded or at night, the awning can be retracted or rolled up, leaving the area more open. Shade sails are tightly-tensioned fabric swaths that are anchored at the corners and provide shade. Unlike awnings, shade sails are not permanently affixed to the side of a building. These shade sails come in a wide variety of shapes, sizes and colors, and are often made out of high-density, UV-resistant fabrics. Shade sails can be an inexpensive and visually-pleasing option for homes, businesses and areas that aren’t good fits for traditional awnings and canopies. Sun canopies are fabric-covered structures that provide protection from the elements, decoration or business identification. Canopies are usually free-standing, or are attached to a building on one side and to support posts on the other side, whereas most awnings are completely supported by the building on which they are mounted. Awnings specially built to attach to RVs and mobile homes are known as camper awnings. These are usually retractable awnings that roll up tight to the side of the RV to allow for easy transport. RV awnings can help provide a shady place to sit outside of the camper and may help keep mobile homes cooler by deflecting direct sun from the exterior. Window awnings are those awnings that are installed over windows and doors to block direct sun. Window awnings are often made of high-grade coated fabric, but they can also be aluminum awnings that are permanently affixed to the window frame. Window awnings can help keep homes cooler and prevent fading of furniture and carpeting by blocking UV rays. 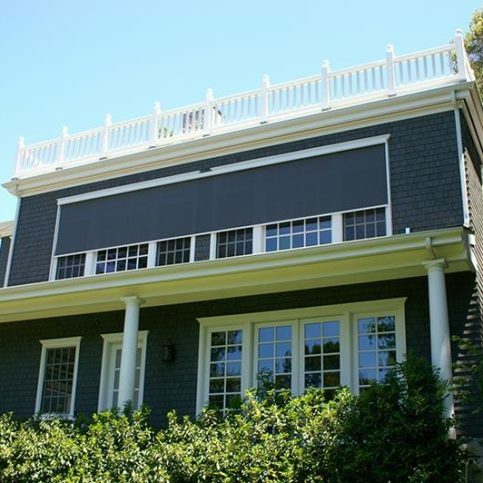 Aluminum and other metal awnings are permanently affixed to the side of homes and businesses. These are often decorative and block harmful UV rays and the heat of direct sun. 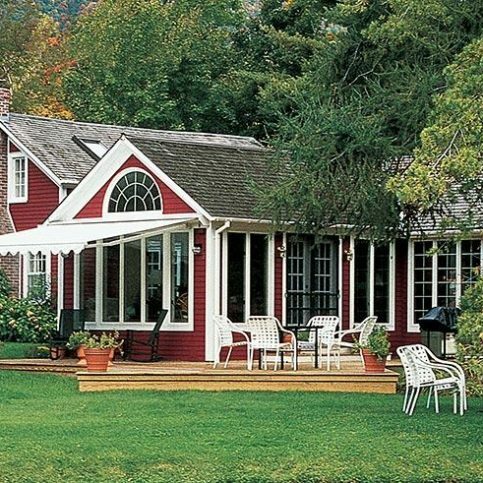 Many homes use permanent metal awnings as a decorative feature. 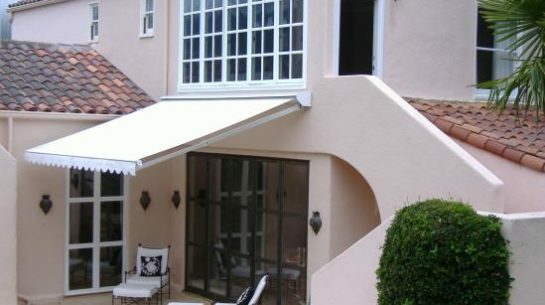 Aluminum awnings may come in a variety of colors and styles. Patio awnings are retractable or fixed awnings that stretch over a patio or deck area. They block direct sun and keep the patio cooler, making for more comfortable outdoor living in Bernal Heights, Bayview, Richmond District and Nob Hill and rural areas. Awnings that are affixed to the sides of homes or businesses are considered permanent. However, movable awnings and canopies are those that are freestanding. These freestanding awnings can be shifted, like very large patio umbrellas, to block sun at whatever angle is needed. Movable awnings are popular on residential patio and decks, business courtyards, and in restaurant outdoor seating areas. Awnings at businesses in San Francisco may serve dual purposes: blocking sun and providing decoration and even identification. Business awnings can have the business name, address and even advertising slogans or information included on them. Simple awnings can be easy to install, but some awnings require professional installation. Awnings for multi-story buildings, metal awnings, permanent awnings, and homes that require awnings on many windows may be good candidates for professional awning installation services in San Francisco. 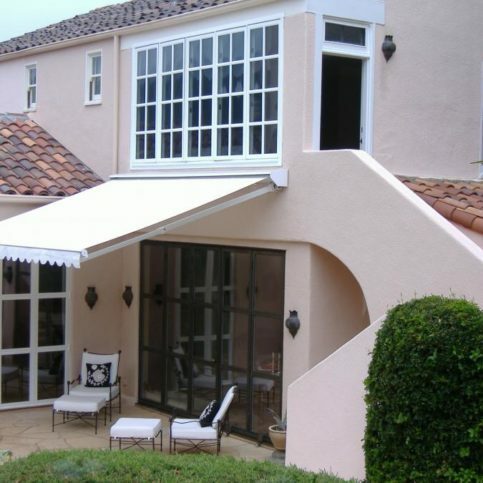 Regardless of what type of awning you’re looking for, or whether you live in Pacific Heights, North Beach, Excelsior District and the Sunset District or another area, there is a manufacturer who can provide it. Some of the more well-known awning manufacturers and awning companies are listed below. Awnings companies have their own language to describe the products, materials and installation techniques used in their industry. The glossary below may help you decipher the phrases used by your awnings provider. If you still have questions regarding the exact products you’ll be receiving as part of your deal with a local awning contractor, be sure to ask for clarification and descriptions in layman’s terms. A material’s ability to withstand wear from flapping, friction, scraping, rubbing or other awning-to-awning contact or contact between the awning materials and the building on which they’re mounted. Acrylic fabrics are those with manufactured fibers made from synthetic polymers. Acrylic fibers often stand up to weather, wear and harsh conditions better than natural fibers. Like aluminum pipes, aluminum tubing is a light, strong alternative to steel piping and tubing. Aluminum tubing is often used to create the frame of outdoor awnings because it is available in a variety of sizes and shapes. It also resists rust and is light enough to install on eaves of homes and businesses. Awnings are additions to homes or businesses that are used for decoration, business name advertising, and protection from the elements. Most awnings are made of a light aluminum skeleton covered with a fabric or acrylic-coated fabric sheet to keep out sun and rain. Some permanent awnings come in the form of metal awnings. Awnings may be permanently affixed, stand-alone units, removable, manually-retractable, automatically retractable or motorized. Awnings are different from canopies in that the weight of awnings are completely supported by the building they are attached to, while canopies are usually free-standing or supported on one side by separate posts. Like awnings, canopies are fabric-covered structures that are meant to provide protection from the elements, decoration or business identification. Canopies are usually free-standing and are often attached to a building on one side and to support posts on the other side, whereas most awnings are completely supported by the building on which they are mounted. Canvas is a heavy fabric usually made from cotton, linen or synthetic threads. Canvas is identified by its tight, even weave and smooth feel. Canvas is most often used for industrial purposes, sails, awnings and canopy tops. Canvas may be dyed to provide additional decoration. Coated fabrics are those that are treated or covered with a substance that makes them resistant or impervious to water, fading and wear. Most coated fabric used for awnings is acrylic-coated canvas, but they can also be made from other tough fabrics coated in rubber, resin, plastic, melamine, oil, PVC, urethane, neoprene and other tough industrial coatings. The total length of awnings from the mounted wall to the farthest edge when they are fully extended is known as the drop. Some awnings are coated to be fireproof or fire resistant. These fabrics are treated with flame retardants that make the fabric impervious or resistant to flame. Awnings on homes in fire-prone areas should be fire resistant or fireproof for added fire protection. Most awnings attach to and are supported by a home, building or other structure. However, freestanding awnings do exist. These are awnings that are supported by posts poured into concrete footings or heavy, but moveable, bases. Freestanding awnings are sometimes considered canopies. Awnings with built-in lighting are considered illuminated awnings, or lighted awnings. These lit awnings have lighting systems built-in behind the fabric so that the canvas of the awning is lit. Most canvas awnings and canopies are treated with substances that prevent or discourage the growth of mold, mildew and other fungus. While most awnings can’t be made completely mildew-proof, mildew-resistant fabrics can impede the growth of mildew and extend the life of the product. Some automatic retractable awnings are enabled with an electrical contact that measures the air for moisture and automatically retracts the awning if it begins to rain. Retractable awnings are those that can be manually or mechanically retracted, rolled or collapsed. This is usually done to prevent the awning from being damaged by snow accumulation, rain, heavy wind and when the canopy isn’t being used. Retractable awnings are popular over patios and yards where coverage is only wanted during peak sun hours. Retractable awnings can last longer than fixed awnings because they are less likely to be damaged by bearing heavy loads. Some automatic awnings are enabled with a sun sensor that causes the awning to automatically extend when the sun shines and automatically retract when the sun sets or clouds cover the sun. 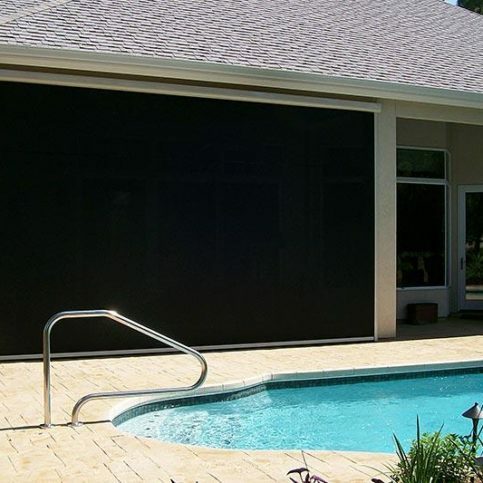 This prevents you from having to physically extend your awning or monitor for weather changes, while still protecting your home or patio from direct sun. 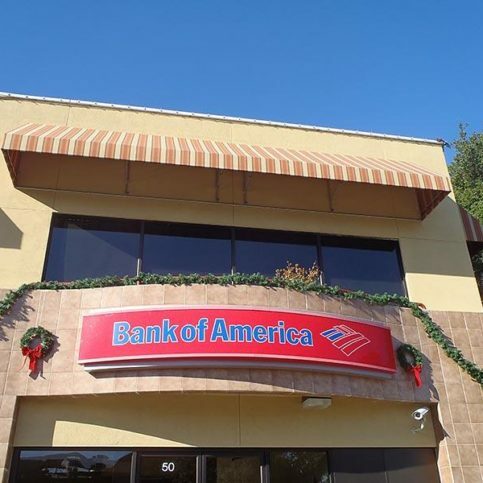 A decorative front piece that attaches to awnings to create visual appeal. Valances are often scalloped and edged with a complementary color to provide decoration. Most valances are approximately six inches long and drop down from the front support bar, which hides the mechanical workings of the awning from view. Automatic awnings may be outfitted with wind sensors that automatically retract the awning if the wind or wind gusts become to strong for the awning. 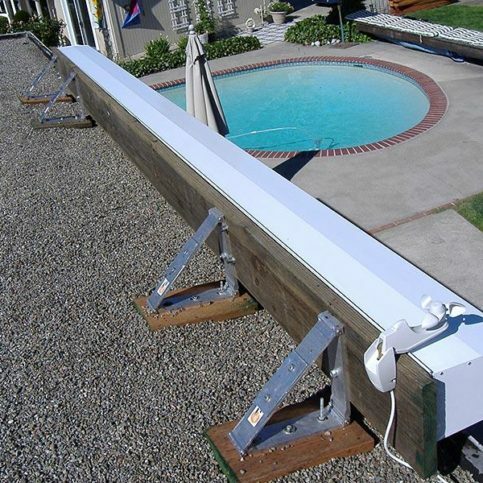 This helps prevent damage to your awning and keeps you from having to monitor the weather. Some awnings are automatic, some are closed using a manual winding handle, and others have a combination that allow you to use either manual or mechanical means of retraction. Automatic winding mechanisms are usually housed in a box to protect the electrical components. Manual winding mechanisms are usually in the form of a crank handle. Obviously each awning and installation site are different, so you’ll want to ask job-specific questions of the awning contractor you’re considering. However, there are some common questions that homeowners and business owners want to know before purchasing a new window awning. Many of the most common questions and answers are listed below for your convenience. Q: Why choose Diamond Certified awning provider? A: Diamond Certified helps you purchase new awnings with confidence by offering a list of top-rated local companies who have passed the country’s most in-depth rating process. Only local awning manufacturers and awning companies rated Highest in Quality earn the prestigious Diamond Certified award. Most companies can’t pass the ratings. American Ratings Corporation also monitors every Diamond Certified company with ongoing research and ratings. And your purchase is backed by the Diamond Certified Performance Guarantee. So you’ll feel confident choosing a Diamond Certified awnings company to build, provide and install your awnings. Q: How do I know what type of awning is right for my home or business? A: To find the right awning solution for you and your home, you’ll want to consider your specific needs, the location of your home or business, the number of awnings you’ll want to install and on which windows you want them, how you hope to use your awnings, your goals for your new awnings and the amount you have to spend on purchasing and installing new awnings. 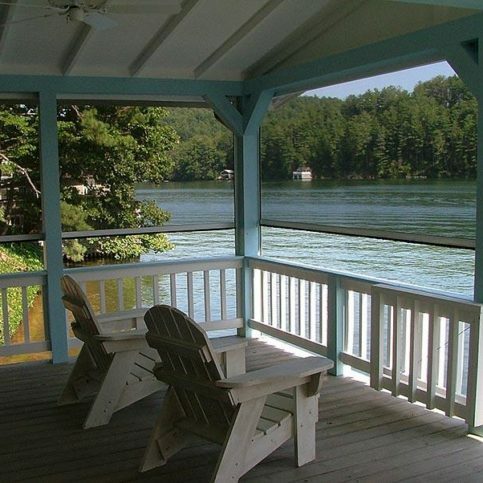 Think about whether you want fixed awnings, removable awnings or motorized awnings. Freestanding awnings are also available. Q: Can I expect my awnings to hold up in windy conditions? A: Most high-quality awnings are sturdy enough to handle windy weather. However, if your home is in an area that regularly faces strong or gusty winds, ask your awnings dealer which brands and models they recommend. 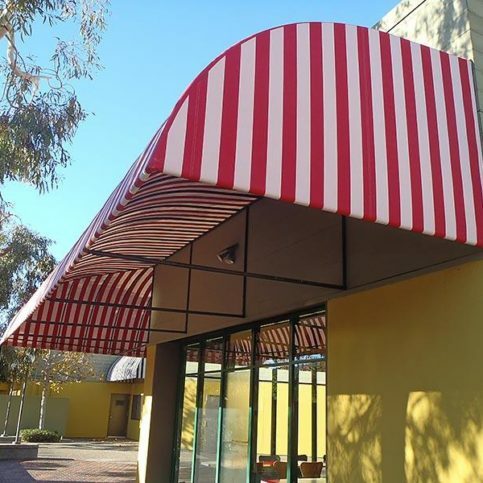 Some awnings are better built to stand up to high winds or gusty conditions. Some also come with optional braces and accessories to reduce strain and movement in the wind. You may also want to invest in retractable awnings and motorized awnings that can be closed on very windy days. Q: Will a window awning help keep my home cooler? A: Yes, properly-positioned awnings can block direct sun rays from shining in windows and glass doors, which can keep your home much cooler on even very hot days. This can save you money on air conditioning and cooling. Q: Will awnings keep my furniture and carpeting looking newer? A: Yes. Opaque awnings that shade windows and glass doors keep direct sun from fading carpeting, furniture and other belongings. You’ll want to take note of when the direct sun shines in your home so that you can be sure you get new awnings in the correct size and position. Q: Can I install my new awning myself? A: That depends on the type of awning you’ve purchased, where you want to install it and how handy you are at such home improvement projects. Some awnings are easy to install, and come with all of the setup materials and instructions. Other awnings or installation locations may require you to hire a professional awning installer to do the work. As with any home improvement project, consult a professional or company representative with questions and advice if you are unsure whether you can install the new window awnings yourself. Many awning dealers provide installation services for an additional charge. Q: Where can I install awnings? A: Awnings are flexible, and styles exist for installation almost anywhere. Homes, businesses, mobile homes, garages, pool decks, outdoor living areas, porches, patios, restaurant outdoor dining areas, playground areas and other spaces are all good fits for awnings. You will have the most installation options if the area in which you wish to install the awning has a stationary wall, but freestanding awnings are also available for yards, patios, playgrounds and other areas without solid walls. Q: What are awnings made out of? A: Most awnings are made from specialty woven fabrics. Many are laminated or coated to make them stronger, waterproof, fire-resistant and resistant to mildew and fading. Some awnings are also treated with materials that make them UV resistant, which can provide you with sun protection equal to high SPF sunscreen. Good-quality outdoor awnings are often made with dyed-in colors, so they hold their color and don’t fade over time. You can also find awnings with protective coatings that help them last even longer, despite weather and natural degradation. The metal parts are usually built with powder-coated aluminum, or another lightweight metal that resists rusting and corrosion. Well-made awnings can last up to 10 years if you care for them as the manufacturer recommends. Q: Will my new awning be waterproof, or will it leak in the rain? A: That depends on the type and quality of awning you purchase. Many outdoor awnings are made with laminated or coated fabrics and then sealed with a clear coat that renders them water-repellent or even waterproof. In most cases, this will prevent leaks and keep water from seeping through. To prevent standing water or pooling, you may want to install the awning at a slight angle to help water roll off the fabric. Some awnings are peaked or pitched, which naturally discourages water pooling. Other awnings should be rolled up, lowered or retracted during rain, especially heavy rain. Q: How should I clean my retractable awning? A: Each manufacturer has their own preferred cleaning instructions for each of their products, and you should find out the recommended method for your exact model. Cleaning your awning in a way or with solutions other than those recommended may void any warranties. This said, most awnings can be cleaned by brushing the dry fabric with a soft or medium bristled brush. For heavier dirt, you can usually safely use warm water with a mild detergent. Stains and heavy soiling may require special cleaning instructions from the manufacturer. Your awning may very well last longer if you clean it often and schedule preventative maintenance for moving parts that require service. Q: Will I have to remove and store my new awning during winter or inclement weather? A: Permanent awnings are normally made to withstand all types of weather, and usually do not need to be removed. Retractable awnings can almost always be left up year-round; however, you may want to close the awning during snowy conditions or strong storms. Refer to the manufacturer’s instructions for suggested care and storage. Q: Should I invest in a motorized retractable awning, or is a crank awning just as useful? A: Awnings will block sun just as effectively whether they are motorized or manual, but motorized awnings are more convenient. Motorized awnings immediately roll out or retract with the flip of a switch, while manual awnings need to be cranked and/or pulled in and out. The decision is yours, but think about your priorities and whether you’d use the awning more often if it was easier to open and close.